You’re not likely to come face to face with one of the Korck Publishing “Sharks of the World – 3: Oceanic Depths” species unless you are quite a long way down! 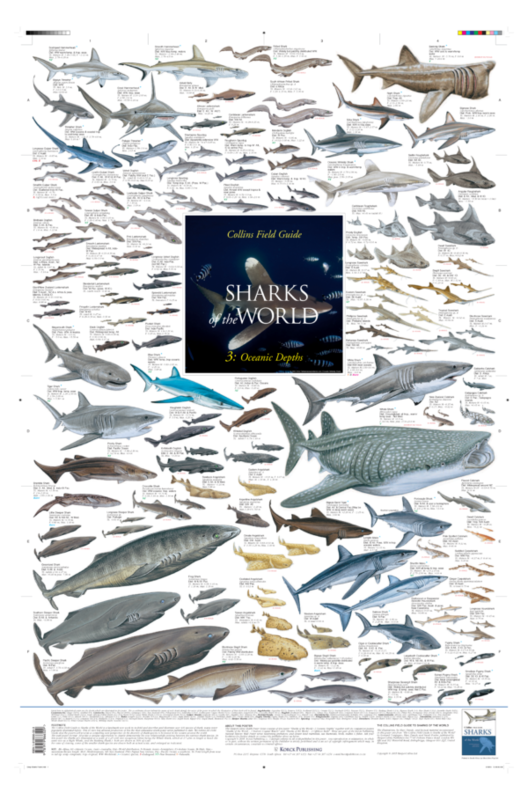 Rather view these species on the Korck Publishing “Sharks of the World – 3: Oceanic Depths” wall poster subject – the safer, drier option – which shows 108 shark species brilliantly illustrated by Marc Dando, including, angelsharks, carpetsharks, catsharks, dogfish, gulper sharks, hammerheads, houndsharks, lanternsharks, mako, pygmy sharks, roughsharks, sawsharks, sleeper sharks, spurdog sharks and thresher sharks, eg the sleeper sharks, and many other blue- and green-eyed species of this zone. The wall posters measure 900 mm x 594 mm (35.4 x 23.4 inches). The poster are double laminated (ie laminated both sides) for ultimate protection, and will be shipped to you in a sturdy postal tube. Many of our customers throughout the world choose to frame or blockmount their posters such is the quality and impact of the posters themselves.